An office without snacks is like Disneyland without magic. Employees need fuel for their brains, which require around 400 calories just to function every day. But as simple as it may sound, getting snacks for the office isn’t always an easy task. When it’s time to stock up on office snacks, many office managers will simply head to the nearest Costco to pick up a jumbo box of potato chips or cookies, thinking that’s the easiest and least expensive option. It’s easy to just look at the price tags to see how much the snacks cost, but it’s also easy to forget how much your time is worth. On the surface, grabbing snacks at Costco might seem like an inexpensive option, but when you calculate the cost of your time to go to the store, pick out the right snacks, wait in line, and deliver the food back to the office, that “cheap” option doesn’t look so cheap anymore. Office managers are busy people with never-ending to-do lists, and buying snacks for the office can eat up hours of precious time each month. So while snack subscription services might seem more expensive upfront, they can save you time — which saves you money. Also, because WorkPerks snack services can be viewed as a health and wellness benefit, health insurance providers will often offer funds or allowances to corporate customers. In fact, the Affordable Care Act will even offer discounts for participants’ health insurance coverage if employers adopt wellness programs. Taking advantage of healthy office snacks might not seem like a high priority for office managers, but sometimes the smallest things make the biggest difference. We see it every day in the offices that enjoy WorkPerks services. Snacks can brighten any office’s culture, and it’s funny how a unique variety of artisan snacks from around the country can bring an office together. Those happy employees then become more productive employees, which translates to greater business success. Our experiences aren’t just anecdotal; there’s real science supporting the correlation between having food available and increased or lost productivity. In fact, 56 percent of full-time employees say they’re either “very” or “extremely” happy at their current job, according to a survey from grocery delivery company Peapod. And that’s great. But that number leaps to 67 percent among employees who have access to free food at the office. Furthermore, as competition gets stiffer among businesses trying to hire the best of the best, brands have started to use company perks to lure potential employees — and 48 percent of job candidates said those perks, such as office snacks, play a part in their decision to accept a job. 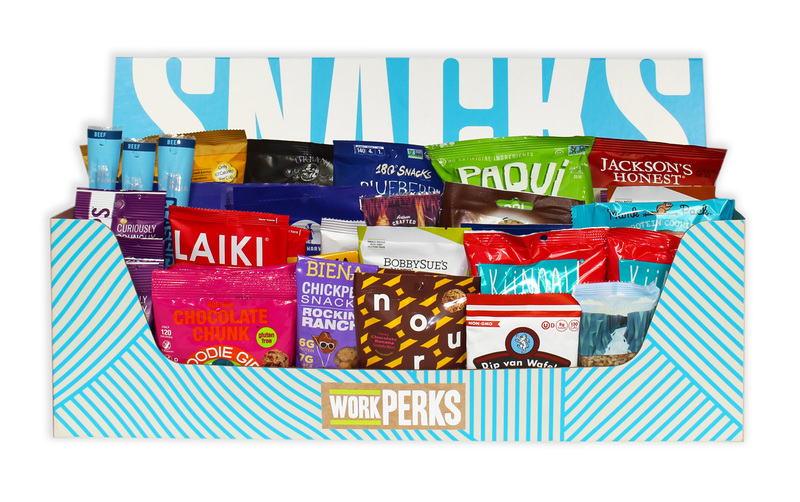 Here at WorkPerks, we often get emails from office managers and human resources managers saying that using a snack subscription service has helped streamline their responsibilities when ordering office snacks, which allows them to focus on other things that need to get done. Not only do snack subscription services make office managers’ lives easier, but they’re also good for your company’s bottom line. As a business, you can always make more money. But productivity lost because employees are heading down to the corner convenience store for a snack is irreplaceable. Replenishing the office snack stash might seem like a low-priority task for most office managers. But the right snacks can create happier (and more productive) employees, save employers time by avoiding countless trips to the store to buy snacks, and ultimately increase your bottom line. Not to mention, office managers will solidify their position as the favorite person in the office for delivering everyone’s favorite snacks.